Hey all! After a few busy days, a bit of a stomach hiccup, and working on some of the most dull work, I’m actually starting to get back, and what better way than to discuss something I’m blatantly blind about. 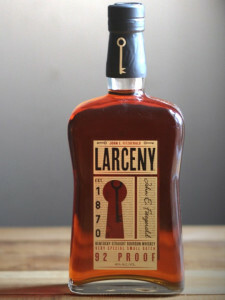 Larceny Very Special Small Batch is a tribute to a story that Pappy Van Winkle told his granddaughter about the creator of John E. Fitzgerald, the creator of Old Fitz, which was eventually sold to Pappy. Short story shorter, according to Sally Van Winkle, Fitzie was a bonded treasury agent in charge of collecting taxes, and would steal himself the best bourbons he could find by using his keys. As a funny old guy, Pappy added in wheat instead of Rye to make a softer profile.